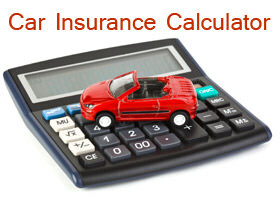 For the last two years Carinfo.co.za has been conducting a comparison analysis of all the known insurance companies in South Africa in the attempt to find out which one is best (check out the analysis done for previous years: Best Car Insurance Company in SA for 2013, and the Best Car Insurance Company in SA for 2014). Prior to our 2013 analysis, such research had never been done, and we got a huge positive response from the public. Since then, we’ve made it a tradition as a service to the public and our readers. So, here we go. Let’s find out which car insurance company ranks best for 2015. We took most of the more known car insurance companies in South Africa and divided them into two groups (the ‘smaller’ companies and ‘bigger’ ones*). Then we checked out how many complaints each company received on Hellopeter** in each of the 5 categories selected (the categories were the most common and important ones), and used a point system to find out which company was best. We then added in extra points for the overall number of compliments each company got. Then we did the math, and got our results! * See explanation regarding the dividing of the companies in the next paragraph. 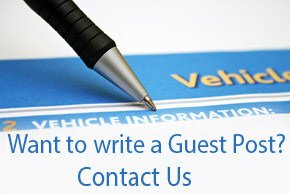 ** Hellopeter is an independent website on which customers can review the service they received from various companies. The data for this research was based on reviews from January 2015 to December 2015. First, we divided South Africa's major insurance companies into two groups, those that received less than 500 reviews on Hellopeter (the ‘small’ companies), and those that received more (the ‘big’ companies)*. Although the number of reports does not prove the actual market size of the companies, it does give us a fair indication of the number of customers each company has. Additionally, seeing as how the research was based on the data from Hellopeter, it was more logical to base the companies' size on this information as well as this makes the ‘playing field’ more equal. * For the removal of doubt, the categorizing of big/small companies does not reflect their market control, value, amount of clients or any other metric, and was only done based on the amount of reviews on HelloPeter and for convenience purposes. Then, we looked at the kinds of complaints that each company got in five different categories (billing/accounts, repairs/servicing, feedback/response, call centre, and breach of contract). The selection of the categories was based on two key factors: where the most complaints were made (more data), and which issues are critical to customers. In each of these five categories we looked for the insurance companies that had the least number of complaints, and based on that gave out points. So, the company with the lowest percentage of complaints in each category was the ‘winner’ of that category, and received the maximum 5 points. The company with the next lowest amount of complaints received 4 points and so on. If companies were ranked equally we gave them the same number of points. In addition to these 5 categories, we decided that it was important to also take into account the number/percentage of compliments or positive reviews that the companies received. Seeing as how consumers are more likely to complain than to dedicate time to write a compliment (especially in insurance related issues), we decided to give a maximum of 10 points in this category. So, the company with the highest percentage of compliments got 10 points, the next highest got 9 points, and so on, till 1 point. 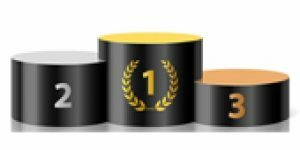 Finally, we added up all the points from all the categories and declared our winners for each of the two groups of companies (big insurance companies and small insurance companies). Disclaimer: There are many factors that need to be taken into account when doing such a review, especially seeing how each factor may influence the overall results. In this case, and due to its' availability and organized layout, the main source of our data came from Hellopeter.com, a website that's based on consumer reviews. Seeing how some of the consumer reports on Hellopeter could be fabricated, faked or funded by parties of interest (this, of course, has nothing to do with Hellopeter), and seeing how we did not factor into the review all possible information, we cannot claim that the review is scientific, completely accurate or reflecting the full and true essence of each of the companies. Nevertheless, the influencing of reviews on Hellopeter is not an easy task as the website does require that you give a valid email and phone number, and companies can, and do, contact customers to address their complaints, and if a complaint is found to be ‘fake’, it may be taken down. Therefore, we beleive that whilst the results might not be scientific, they do provide a fair indication of which insurance companies are giving good service and which need to improve – at least based on the data that was evaluated. Finally, we must clarify that we do not support or endorse any of the insurance companies mentioned in this report even if some of them have or do advertise on our platform. We further guarantee that no insurance company reviewed in any way attempted to influence our results prior to publishing this review. Although both these charts show opposite sides of the same picture, it's interesting to see how they mirror each other. It can be all too easy to look on the bright side and see how many compliments a company received, but it’s interesting (and concerning) to look at the number of complaints. We decided to go more in depth, and look at the complaints each company received in more detail, breaking these complaints down into the five categories we mentioned above. As we also mentioned above, we did divide the companies into two groups, “small” companies (less than 500 Hellopeter reviews) and “big” companies (more than 500 Hellopeter reviews). Just as a note: the “big” companies and “small” companies are the same as they were in last year's research, no company moved groups this year. No More Numbers! Show Me the Results! Alrighty then, the moment of truth has arrived. Remember that in order to rank the insurance companies we first gave out points based on the lowest number of complaints in each of the five chosen categories (the lowest percentage of complaints getting 5 points, the next 4 points etc. ), then we gave out points for the most compliments (the highest percentage of compliments getting 10 points, the next 9 points etc.). AA Insurance: AA Insurance came out tops for our small insurance company group, and got the full five points for the lowest number of complaints in both the “feedback and response” category and the “call centre” category. AA also had the third lowest number of complaints in the “breach of contract” category, though they didn't rank in either the “repairs and servicing” or the “billing and accounts” categories. 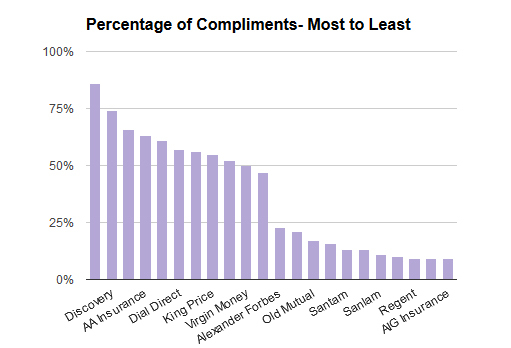 In terms of compliments, AA received the second highest percentage of compliments out of all 12 small insurance companies. 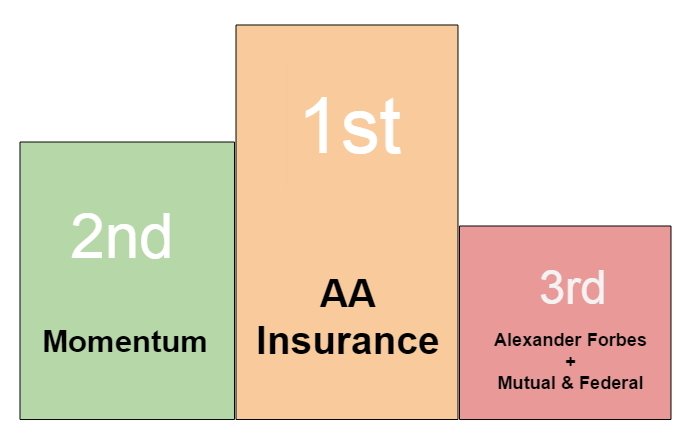 All of this means that AA Insurance, who gained 2nd place in 2014, moved on up to 1st place for 2015. 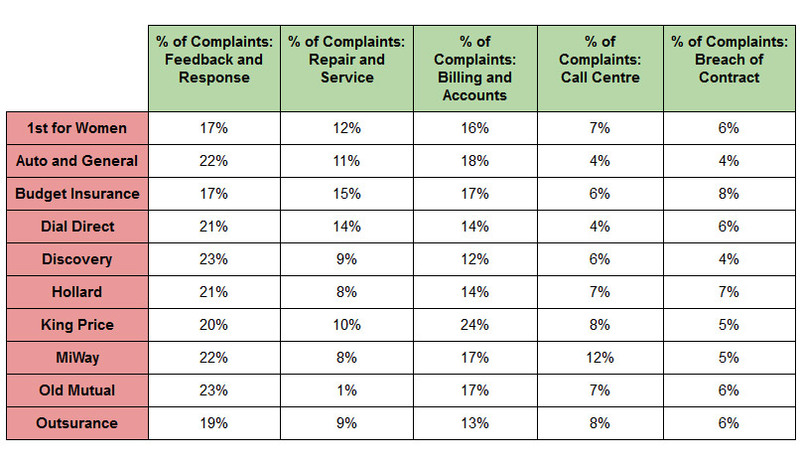 Momentum: Momentum had the third lowest percentage of complaints in the “breach of contract” category, as well as the fourth lowest percentage of complaints in “feedback and response”, “billing and accounts”, and “call centre”. However, Momentum had the highest percentage of compliments of any small insurance company, getting the full 10 points there. So Momentum got 2nd place this year. Alexander Forbes and Mutual & Federal: Both these insurance companies tied for 3rd place in our rankings. 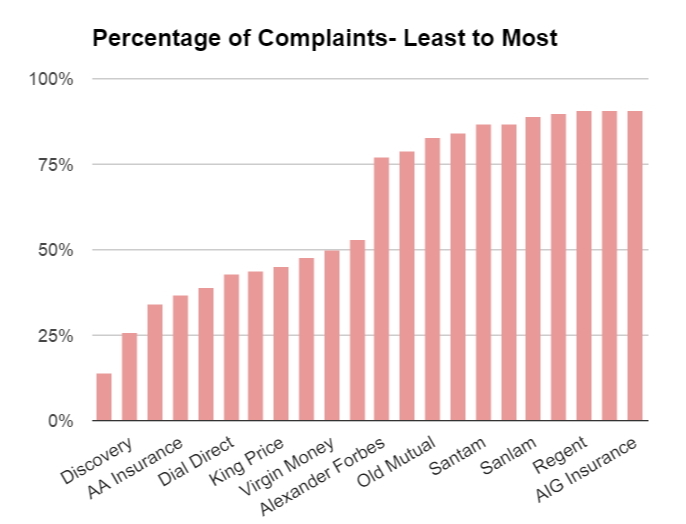 Alexander Forbes got the third lowest percentage of complaints in the “repair and servicing”, “call centre”, and “breach of contract” categories, as well as the fourth lowest percentage of complaints in the “billing and accounts” category. They also got the fourth highest percentage of compliments. 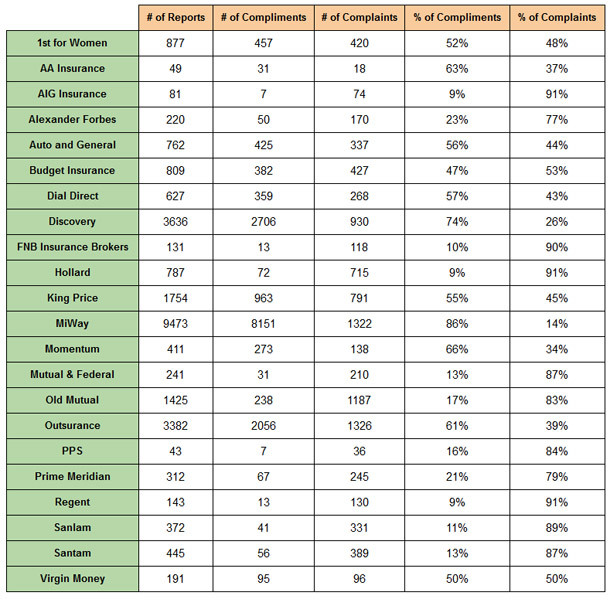 Mutual & Federal got the lowest percentage of complaints for “breach of contract”, the second lowest percentage of complaints for “billing and accounts”, the third lowest percentage of complaints for their “call centre”, and the fourth lowest percentage of complaints in “repairs and servicing”. They also got the seventh highest percentage of compliments. Discovery: Discovery came top of the list for 2015. 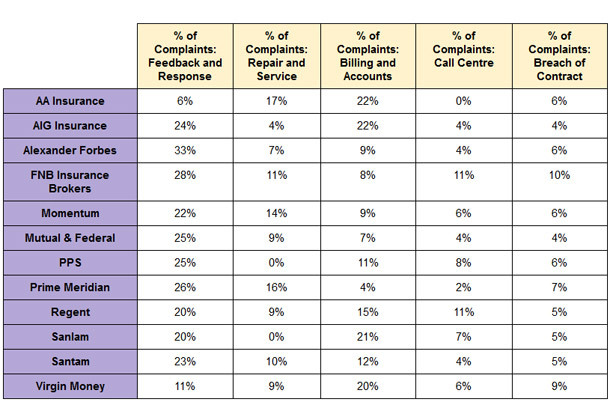 They got the lowest percentage of complaints in both the “breach of contract” and the “billing and accounts” categories, as well as the second lowest number of complaints in the “call centre” category, and the third lowest percentage of complaints in the “repairs and servicing” category. On top of this, they received the second highest percentage of compliments. All of which combines to make Discovery, making their first appearance in our rankings, at number 1! Outsurance: Outsurance ranked in all five complaint categories. 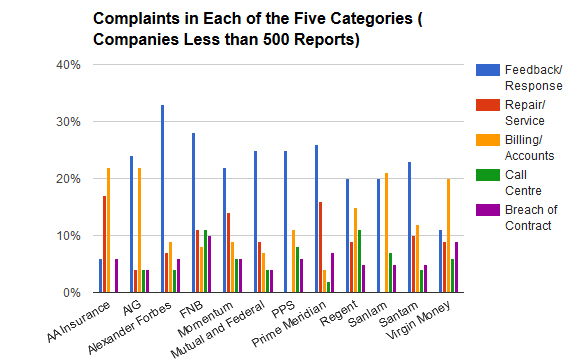 They got the second lowest percentage of complaints in the “feedback and response”, and the “billing and accounts” categories; the third lowest percentage of complaints in the “repairs and servicing”, and the “breach of contract” categories; and the fourth lowest percentage of complaints in the “call centre” category. Plus, they got the third highest percentage of compliments. 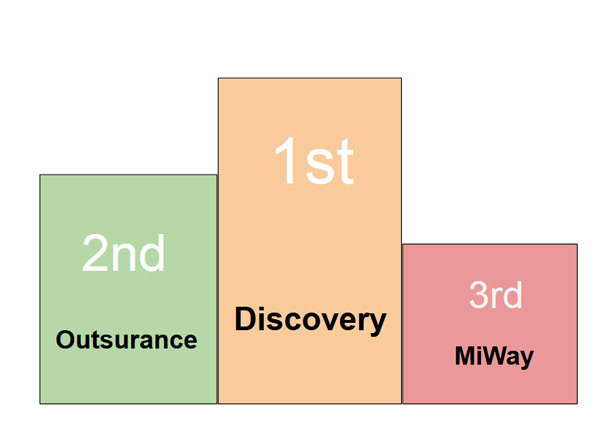 This means Outsurance rank second this year, dropping from first place in 2014. 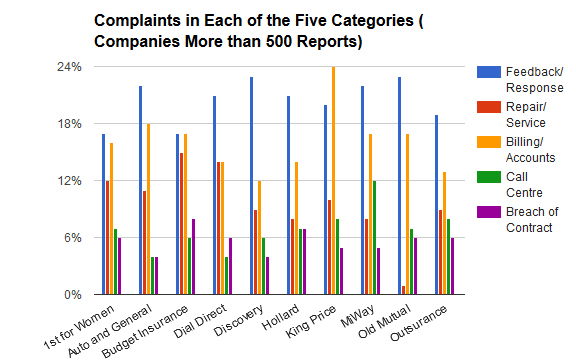 MiWay: Finally, MiWay also ranked in all five complaint categories. They got the second lowest percentage of complaints in the “repairs and servicing”, and the “breach of contract” categories; and they got the fifth lowest percentage of complaints in the “feedback and response”, “billing and accounts”, and “call centre” categories. However, MiWay got the highest percentage of compliments of all ten big insurance companies, leaving them in third place overall. As mentioned, we do not proclaim that the above research is scientific and/or 100% accurate. 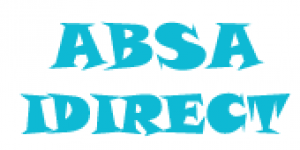 Nevertheless, we are confident that it can serve as a good indication as to the quality of service that the various car insurance companies provide and allows the consumer to make a better informed decision. As always, we advise all our readers to get car insurance, to read up on the subject before, and to get at least 2 quotes. Care about your friends? Share this article with them so that they too can enjoy the info. Think differently about the results? Feel free to comment here below. 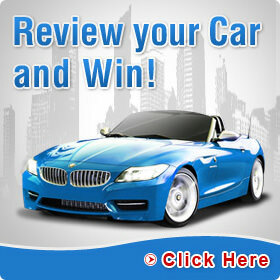 All rights to this article (including images and graphics) belong to carinfo.co.za. You may not copy this article, or major portions of it, without our prior written consent. Nevertheless, we do like to share! So, feel free to quote and/or mention information from this article, so long as you give us you mention Carinfo.co.za and link back to the article. Also, if you can refrain from mentioning the 1st place winners, so that the readers will have a reason to click to the full article, that would be appreciated.